Welcome to the westside of Bend and the Cinder Cone Cottage. You want the best location in Bend for your getaway and you'll find it here. 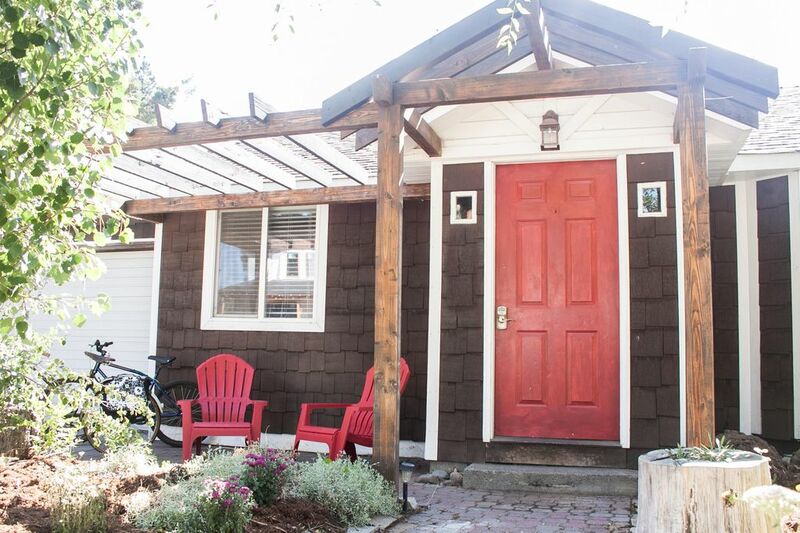 This adorable cottage is in one of the best neighborhoods in Bend! Walk 1 block to shops and restaurants on Galveston (10 Barrel, The Victorian Cafe, Ida's Cupcakes, the Food Cart Pod and much more). So convenient to the very popular west side Galveston neighborhood. Walk 5 blocks to the Deschutes River and Mirror Pond and downtown Bend is just another 5-10 blocks beyond! The Cinder Cone Cottage has a ski chalet feel with vaulted wood ceilings, large wooden beam, fireplace, skylights and a cozy loft above one bedroom. Brand new carpets and living room furniture will insure your stay is comfortable and cozy! The Cinder Cone, is an updated 1925 cottage is waiting for you in the so popular westside neighborhood of Bend, Oregon! This is the location folks want when they visit Bend...you can walk or ride (4 cruisers provided) to just about anywhere! The cottage is on one of Bend's city maintained gravel streets, a blast from the past and you'll find them scattered across the westside. The Cinder Cone has 2 bedrooms, 1 bath and sleeps 4 people comfortably and 6 people cozily (queen sleeper sofa with memory foam mattress). The kitchen is fully furnished for your cooking needs and there is also a gas BBQ in the backyard for your use. All bed and bath linens/towels are provided. There is a gas fireplace on a river rock hearth in the living room with vaulted ceilings with skylights. There is a new wall mounted heat pump providing A/C and lots of heat year round. We hope you will enjoy your time in Bend as much as we do at our cozy cottage! The Cinder Cone Cottage has code access, so there are no keys to lose. There is a fully fenced, landscaped backyard complete with your own private hot tub. There is also a jetted tub in the bath. Above the second bedroom is a loft, the perfect hide-away, stocked with books and games. DVDs, games and puzzles are also provided. Feel free to use our cruiser bikes around town during your visit. Helmets and locks are provided. Grab a cruiser bike or just hoof it to local eats and entertainment. You are just a stone's throw from the center of Bend including: The Old Mill District, Les Schwab Amphitheater, Drake Park, Mirror Pond and Downtown Bend! The Deschutes River is 5 blocks away and you can walk or bike to local restaurants, parks and shops. Phil's Trails are just 3 miles up the road. Mt Bachelor is an easy 20-30 minutes away. The Park & Ride for shuttles to Mt Bachelor (winter) or the Deschutes River Float (summer) is about 10 blocks away. We live and work on the westside of Bend and have been proudly providing our vacation rental homes to Bend guests since 2008. We are nearby if you have questions or would like a dinner recommendation. We stayed in many of Bend's vacation rentals before moving here and are happy to provide our guests with great amenities at great prices. We have many returning guests and hope you will be among them! Lofted log ceilings, skylights, this is a loved 'mill' cottage with sweet quirks and character. The loft is favorite with kids & adults. This is the cottage that insured we fall in love with Bend! Stay in the heart of Bend, Oregon! The Cinder Cone Cottage awaits and is so walkable to many westside restaurants, cafes, activities. Downtown Bend is just around the corner. Grab a cruiser bike and roll downtown. You'll be glad you stayed! We came down for the night for a soccer game and loved the cottage. Cozy and welcoming. We enjoyed the quick walk to dinner and the cozy fire after the hot tub. Accidental left clothes in the dryer and we had a quick response and return for a small fee. Thanks for a nice trip. Awesome place and so convenient - walked to everywhere. Thanks for sharing this place! We loved the cinder cone cottage. Walking distance to west side grub and Drake Park. We loved the hot tub and snowy back yard. We all had enough space for quiet activities and all the amenities of home. Can't wait to visit again. Great place. Loved the hot tub, the wood burning stove, and the location. This is a clean, quaint, comfortable, well appointed cottage with a great location. This two bedroom bungalow has a lovely living room with all the amenities for comfort. The gas fireplace will keep you warm while enjoying the ambience from the flames. The house also contains a ductless heat pump great for heating or cooling. The kitchen is functional with lots of items needed to make a meal. The house is really well stocked. The bathroom has a jacuzzi tub or you can enjoy the hot tub in the lovely fenced backyard. I would recommend and would personally stay again. All cancellations are subject to a $75 cancellation fee. Cancellations made with less than 30 days notice may be non-refundable. Please consider trip insurance for your trip. See our rental agreement for full details. If you reserve at a 3rd party website, we are unable to refund your 3rd party fees. -- When your arrival is less than 30 days in the future, 100% payment is due when making the reservation. When your arrival is more than 30 days in the future, 50% payment is required to confirm your reservation. The remaining balance due will be collected 30 days prior to your check-in date. We always offer last minute pricing when available...Check our calendar!